He said if you can afford it, get the biggest aperture you can get and make sure to get a good quality German Equatorial Mount, especially if you are doing astrophotography. 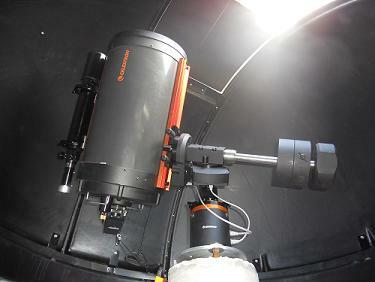 I was sold and the saving began for the Celestron CGE 1400 FS. The Celestron German Equatorial (CGE) Mount is an Observatory-class computerized mount and can have a payload weight of 65 pounds. Once the scope is aligned, it is very good at slewing to a desired target and tracking. The Allstar Polar alignment feature is worth its weight in gold. Polar aligning takes only minutes once the scope is accurately aligned. See the Tutorial section on the process involved in Polar Aligning. Aside from the slewing problems I encountered when I first purchased the scope (See Blog Feb. 2011), this mount has been stable and problem free ever since. Although the Celestron CGE 1400 Optical Tube is very high quality, the focuser was not sensitive enough for precise focusing. Again after talking with Dr. Moody, he said to purchase a “Feathertouch MicroFocuser”. I found one at Starizona.com. For fine-tuning the focus, this addition to my scope has been worth its weight in gold. 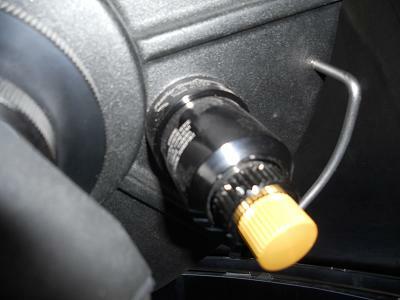 Course adjustments are made using the large outer focus knob, and fine adjustments are made using the brass fine-tuning knob. Below is a picture of the Feathertouch MicroFocuser attached to the visual back of my scope. The instructions were easy to follow the installation was very easy to do. After dabbling with piggyback astrophotography, I had the urge to use the C 1400 as a prime focus lens for the Nikon D3 DSLR Camera. The learning curve was stiff and I didn't know much about precise polar alignment or autoguiding. The first picture we took was a complete failure. The star trails were “zig zag” patterns. I thought something was wrong with the mount. After much studying, I realized that a “Two Star Alignment with “Calibration Stars” was not the same as a precise Polar Alignment. (See my Tutorial about Polar Alignment) The next set of pictures were better, but I could only take about a 2.5 minute picture without the stars beginning to become oval in shape. Thus the guide scope was purchased. I purchased the Celestron 80 mm Guide Scope because I like things to match. I also purchased the Orion StarShoot Autoguider Camera. This little camera was reasonably priced and easy to use. It has not failed me yet in finding a guide star. 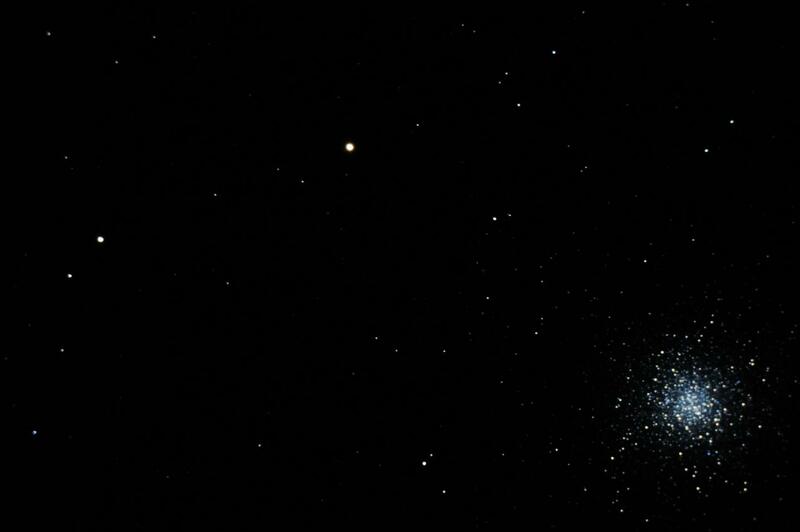 We have been able to take 20 minute exposures displaying completely round stars. 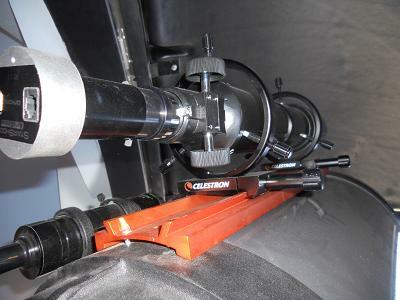 Below are pictures of the Celestron 80 mm Guide Scope and the Orion StarShoot Autoguider Camera. On January 30, 2016 I received a new autoguider camera. The StarShoot Autoguider Pro is more sensitive and smaller than its predecessor. 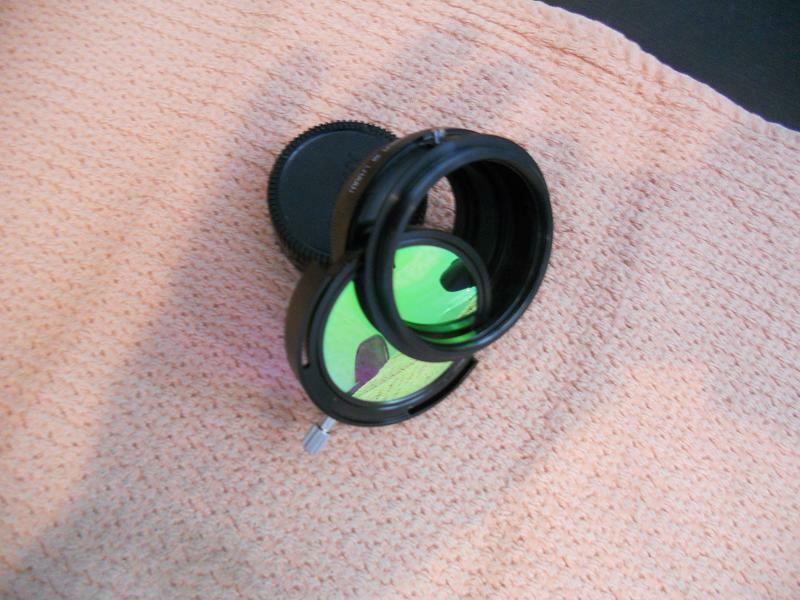 For visual observing, the selected eyepiece gives the field of view and the "Power" to the telescope. The CGE 1400 comes with a 40 mm Plossl Eyepiece as standard equipment. For different viewing and power, more eyepieces need to be purchased. The larger the "mm" size, the lower the viewing magnification or power but wider field of view. For viewing planets, small "mm" size gives higher magnification thus more detail. For deep sky objects such as galaxies or nebulas, larger "mm" size, lets in more light and gives a wider field of view. The choice of eyepiece depends on what you are looking at. The Celestron Corrector / Reducer changes the focal ration of my scope to f7.1. This gives me a larger field of view and decreases the time I need to expose a given shot by about 4 times. It does give a halo around the object I am photographing, but this can be compensated for by stacking techniques using flats (white/bright background pictures) when the image photos are stacked. I presently have the following Eyepieces, the magnification is dependent on the Focal Length of the scope that is being used and is representative of my CGE 1400 at a focal length of 3910 mm. Celestron 40 mm Plossl 1.25 inch barrel. Magnification x 98. Celestron 19 mm Axiom LX 2 inch barrel Magnification x 206. Custom Made 85 mm Plossl 2 inch barrel Magnification x 46. 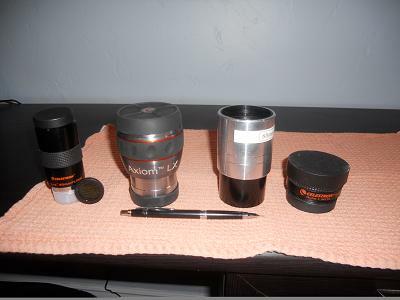 Left to right: 40 mm, Moon Filter, 19 mm, 85 mm and Corrector Reducer. Four things are essential for good astrophotography. A good Equatorial Mount, the imaging scope, the guide scope, and the imaging camera. I have talked about the scopes and mount above. Here I talk about the camera. I am presently using the full frame 12 Mega Pixel Nikon D3 digital camera. Traditional Astrophotographers use specially designed cameras that are used just for astrophotography. I chose to use a multipurpose camera that can be used for everyday use and for astrophotography. For one thing, my son already had the camera. Therefore it did not cost me anything to use it. This camera can be used without the need for "Stacking" pictures with specialized software. The Nikon uses internal noise reduction techniques and therefore using it is more like using a traditional camera for landscape pictures. You set the ISO or "Film Speed", for lack of a better descriptive term, and the shutter duration. The lower the ISO, the less "noise" and better quality of the photograph. The D3 can take very good pictures at 2000 ISO and lower. The higher numbers can cause more noise, but are still acceptable at least to me. See the "Bodes Galaxy" in the gallery. It was taken at 3200 ISO and still looks good. If I desire to shoot above 3200 ISO and reduce the shutter duration, stacking is used to further reduce noise. For a comparable dedicated astrophotography camera, you would spend approximately 3 to 5 thousand dollars. The D3 is more versatile and costs approximately $3,000 on the used market in 2011. I also have a hand controller for the camera to set the shutter duration when the camera is on "Bulb" mode. 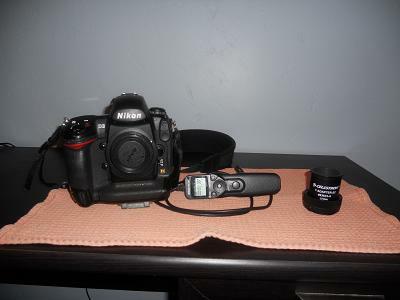 Left to Right: Nikon D3, Hand Controller, and T-Adaptor for connecting to the Scope. In July 2012, my son Brent purchased a Nikon D800 and I purchased the D3. This camera has the same light sensitivity (ISO) as the D3 but has 36 MP. I now have access to two professional cameras when I do astrophotography. On March 26, I received my new NIkon D5200 Camera. I had the camera modified to allow the full light spectrum including IR to be exposed. I also had a chip cooler modification applied to the chip. This modification was done by Spencer Camera and Photos. For anyone doing astrophotography with a DSLR, I would highly recommend them to modify you camera. The reason I purchased this camera is to allow me to use the Hyperstar lens provided by Starizona. This camera has a 27 mm diagonal chip where as the D3 has a 43mm diagonal chip. The Hyperstar lens is optimized for the 27mm format. The camera is lighter, at 1.9 lbs which makes me have a more comfortable feeling when connecting it to my corrector plate. I have not purchased the Hyperstar lens yet, but when I do, I will be ready. The Nikon D5200 also has HD video capability, which will open up a new world for taking pictures of the solar system. 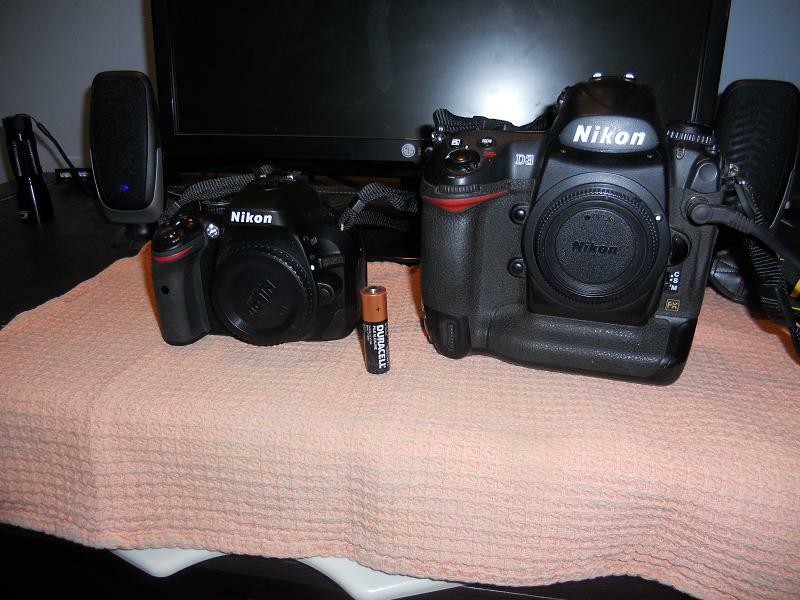 Comparison between the Nikon D 5200 on the left and the Nikon D3 on the right. The D5200 is about a pound lighter and has a much smaller profile. This will aid when I place the camera on the Corrector Plate of the scope when using the Hyperstar System. The "AA" battery is used to give perspective of the size of the cameras. The latest additon to my camera suite is the Nikon D810A. I have essentially retired my D3 and use the 810A camera as my primary astrophotography camera The D5200 is now the backup. This new camera was designed by Nikon specifically for astrophotography. The Infrared filter has been tuned to allow for the IR light component to pass through and not be filtered out. The ISO capabilityies are astounding which will allow for me to take very good pictures with low noise at an ISO of 6400. I try and shoot around 3200 or lower, but if necessary I can shoot at the higher ISO and get good results. The camera is 36.3 MP which allows for exellent resoulution when the raw photos are enlarged. The cost is steep for a DSLR. It runs about $3,200. In December 2012, I purchased a Filter Box and an IDAS Light Pollution Suppression Filter. 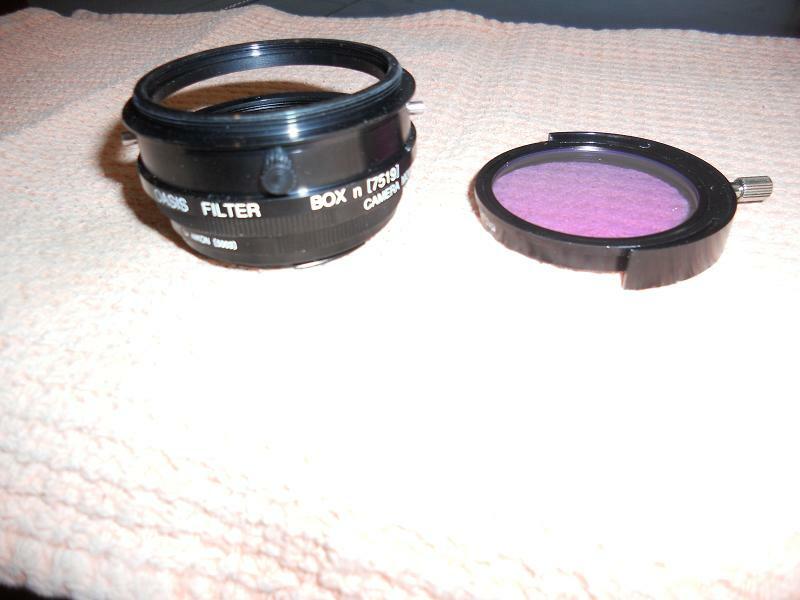 The filter box will allow me to purchase and use any 52 mm or 48 mm filter. I purchased the box and filter from Astro-Hutech. I can now enter the realm of Narrow Band Imaging. The Filter Box and filter is shown below. Filter Box and IDAS Pollution Suppression Filter in its holder. Inserting the Filter into the Filter Box. The Filter Box screws directly onto the Visual Back of the Scope. With the Filter Box, I also purchased the Nikon Adapter which attaches to the Filter Box. The Camera attaches directly to the Filter Box. With this arrangement, I can change filters without removing the Camera. Extra Filter Holders can be purchased from Hutech. I am extremely pleased with the quality and how solid the filter box is. There is no flexure between the camera and scope. When it is cold during the winter months, the Celestron Hand Controller display becomes very sluggish. Therefore I purchased 25 feet of 6 conductor Line Cable with RG 25 connectors and ran the cable directly into the warm room. This way I can center the scope or use Precise GO TO from the comfort of my computer chair. With Live View activated from my Camera, I can see what the scope is pointing at. It will only be used when I am taking pictures. For visual use, I will connect the Hand Controller directly to the scope. I know I could have used NexRemote and it works well, but it causes a conflict with Stellarium when both are used simultaneously. One thing to note if an extension is used, it that the 6 conductors and their colors need to match up and not be rolled. I purchased the Micro Touch Auto Focuser from Starizon (Starizona.com). This device will allow me to focus the telescope through the computer from the warm room. It will allow me to focus the scope either manually using the "In" or "Out" buttons. It can also be used automatically to focus the camera through a computer. I purchased the wireless version so that I will not be tethered to the remote unit while in the warm room. On the left is the Hand Controller. On the right is the remote unit which controls the focusing motor. A "AAA" battery is used to give scale to the image. The Tele View 4X Powermate is on the left and the 55 mm Tele-View Polossl is on the right. Using both together, I get a magnification of around 284x. This is an optimum power level for viewing planets as long as the sky is clear and still. The powermate also quadruples the the image size directly into my cameras giving large photos and movies of planets. The HyperStar lens shown above will give me a 14 inch, f/1.9, 675mm imaging machine. With this I can get incredible pictures in a short period of time and a wide angle. 25 feet of cable and a Coupler to connect the Controller from the Warm Room. To aid in pointing out Constellations, Planets and Stars, I purchased a 5 mW Laser about 1 year ago. This laser did the job, but it was not bright enough and kept fading until it was no better than a presentation pointer. Therefore I purchased a 500 mW Laser for astronomy purposes. 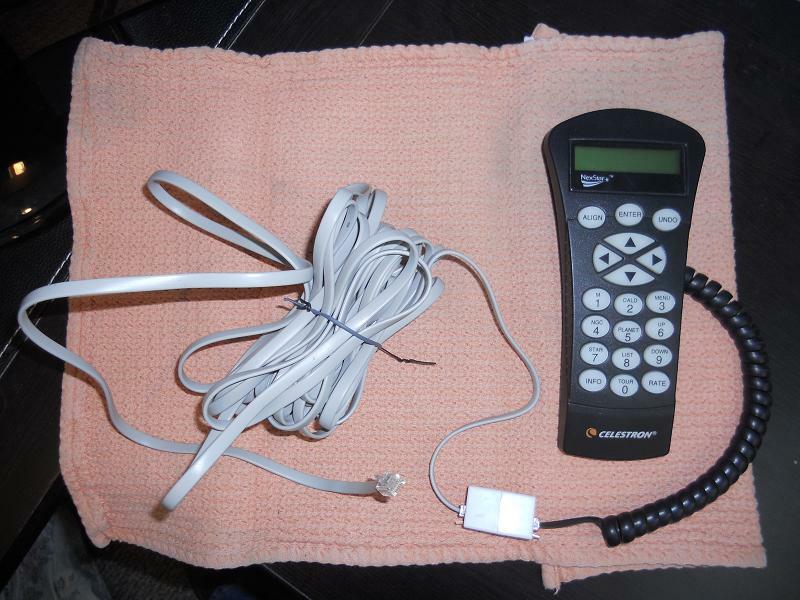 This laser was purchased from Laserpointerpro.com. The laser has a strong green laser that can be seen very well with large groups when pointing at celestial objects. 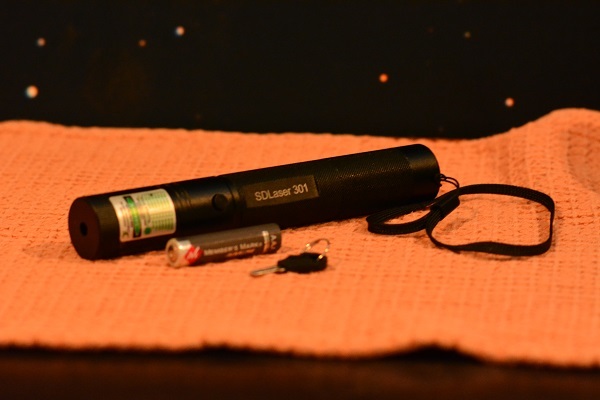 This is a powerful laser and it has a key to keep it safe when children are around. I keep the key locked up in another drawer from the laser. So far I have been very satisfied with the laser. If someone is thinking of purchasing a laser from Laserprinterpro.com, the price is right, but the shipping took almost 3 weeks. The web site said 6 to 8 days, but it was much longer. If you have the patience to wait, then this is a good place to purchase a laser. They have a huge selection. A picture is shown below. The AAA battery is shown for scale only. The actual laser comes with a Li battery and charger. Stellarium: This is used for Scope Control from a computer. It can be downloaded from stellarium.org. This software is excellent for guided tours from a computer and gives a great representation of the night sky. 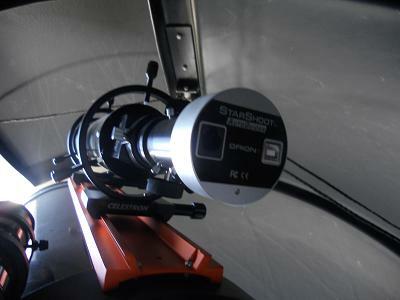 It can control the telescope and help to determine the nights targets. Best of all, it is free!! Nikon Camera Control: This software controls the D3 from a computer. The ISO settings and "Live View" of what the camera is seeing can be displayed on the computer monitor. I use it every time I take astrophotographs. Along with this software is bundled Nikon NX Viewer. This software allows for cataloging and viewing the nights astrophotographing sessions. This software costs approximately $150 and can be purchased from Amazon. PHD Guiding: This software can be downloaded from Stark Labs. This is great software for autoguiding the scope for long exposures. The web site has good tutorials and it is free. Consider donating if you use this software in order to keep updates coming. Astronomy Exposure Calculator: This program is actually an Exposure Calculator in Excel. It was developed by my son Brent Smith to allow for proper exposures at different f/numbers, ISO, and shutter speed. For example, when we shoot a Galaxy, we set the camera ISO at 25600 and shoot for 30 seconds. We look at the exposure, then plug it into the Excel Exposure Calculator. The same shot at 1200 ISO would take approximately 10 minutes. If you would like the calculator, send me an Email. The address is under the "Contact Us" section. Nikon Capture NX 2: This is the post processing software that I use to "Clean Up" my astrophotographs. This software has special abilities unique to the Nikon camera line that I use. It can also be used on other photographs. The cost is around $150. Deep Sky Stacker: This is the software that I use when I do stacking to reduce noise in the photographs. It is free and does the job very well.